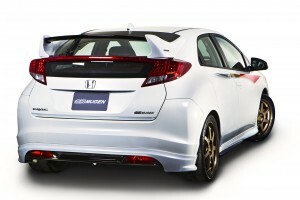 MUGEN unveiled their new concept model, MUGEN CIVIC Concept, which is based on the Honda CIVIC range launched in Europe in January of this year, at the Goodwood Festival of Speed. The Goodwood festival is held from June 29th to July 1st in England, and the MUGEN CIVIC Concept will be displayed on the Honda booth throughout the event. This concept model is fitted with prototype body components comprising of front sports grille, front under spoiler, side spoiler, rear under spoiler, and a rear wing; all are designed to improve the aerodynamic efficiency of the car. Production parts based on these prototypes are scheduled to be launched in Europe in December 2012. The MUGEN CIVIC concept car is also equipped with 18” MUGEN GP forged alloy wheels and sports suspension for improved driving stability. The MUGEN active gate brake system provides increased braking ability. 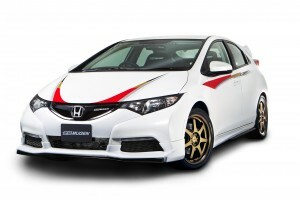 The overall balance of acceleration, deceleration and cornering have all been improved to provide the characteristic sharp, controlled ride and handling for which MUGEN is renowned. The interior features the latest addition to the MUGEN product range with the MS-R full bucket seat. The MS-R seat is specifically designed to hold the driver and passenger securely in position under all driving conditions; and with its full-carbon shell clad in unique MUGEN fabric offering a performance-enhancing weight reduction, the MS-R provides a comfortable secure driving environment and a sportier image.